The CEO oversees the day-to-day administration of IBA and is supported by the Executive, internal management committees, IBA employees, and consultants and contractors. 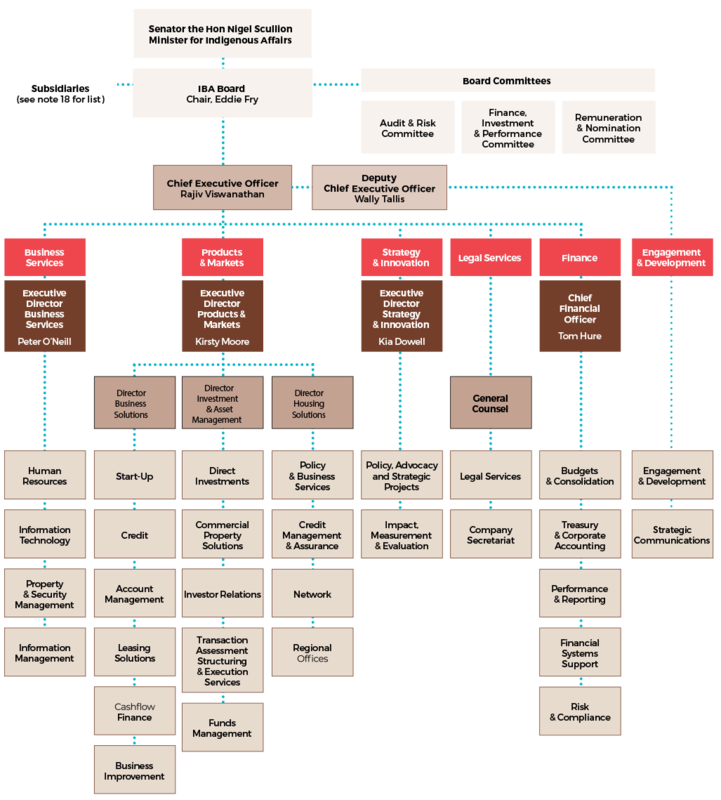 The organisational structure of IBA at 30 June 2018 is set out in Figure 13 on page 68. During 2017–18, IBA implemented a new executive structure and introduced the positions of Executive Director, Products & Markets, and Executive Director, Strategy & Innovation alongside existing executive team members and roles. Key appointments were also made to the heads of the commercial programs and the General Counsel role. The standards of behaviour for IBA are specified in the Chief Executive Instruction on Code of Conduct which includes guidance on managing conflicts of interest. The IBA Enterprise Agreement requires that staff comply with the Code of Conduct to be eligible for salary advancement. The IBA fraud control plan is in accordance with section 10 of the Public Governance, Performance and Accountability Rule 2014. The Public Interest Disclosure Act 2013 provides public officials with certain protections when they make public interest disclosures. The term ‘public official’ includes a wide range of people such as former staff and contractors. IBA has systems and processes in place to ensure that its public officials can make public interest disclosures. The Audit and Risk Committee oversaw the 2017–18 Internal Audit Program. The program was conducted by an outsource provider. IBA has a system of delegated powers that enables decisions to be made on a range of transactions at the appropriate organisational level. The Board governance charter sets out the decisionmaking processes for managing related party transactions and broader conflicts of interest for IBA directors. The charter restricts an IBA director from entering into a prohibited related party transaction while a member of the Board and for six months after leaving the Board. Prohibited related party transactions include the provision of loans or business support to IBA directors, their spouses and dependent family members as well as entities in which IBA directors hold a significant interest. The Board instruction on management of conflicts of interests sets out the decision-making processes for key management personnel including the Executive Management Team. Board members and the Executive Management Team provide annual declarations of interest. In 2017–18, there were no related party transactions that involved an IBA director or key management personnel. In 2017–18, there were a total of 7 transactions where IBA paid other Commonwealth-related entities for goods or services, with a combined value of $162,153. Those transactions were approved in accordance with IBA’s decision making framework described above. Note 13 to the financial statements sets out IBA’s related party disclosure for 2017–18. IBA has a control framework to ensure compliance with relevant legislation. In 2017–18, there were no significant issues reported to the responsible Minister under section 19 of the PGPA Act that related to non-compliance by IBA with the PGPA Act or Rule or an Appropriation Act. IBA’s commitment to quality service is outlined in its customer charter, and IBA has detailed processes for receiving and handling complaints. The complaint management process ensures that any concerns that customers may have in relation to IBA’s services or decisions or IBA-funded service providers are taken seriously and dealt with promptly. IBA maintains a complaints register which is regularly reviewed by management. By adhering to these processes, IBA can learn from mistakes and continuously improve its practices, ultimately improving its customers’ experiences. Section 178 of the ATSI Act enables IBA to engage as consultants who have suitable qualifications and experience. IBA follows guidance issued by the Department of Finance when determining whether an arrangement should be classified as a consultancy. Details of consultancies in 2017–18 are in Appendix A.